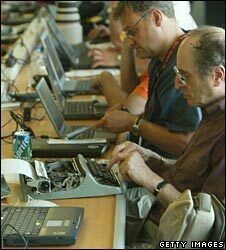 They're clunky, dirty and can't access the internet, yet every year thousands of people buy typewriters when they could probably afford a computer. Why? When asked how he writes, Frederick Forsyth has a simple answer. "With a typewriter." He admits this is to avoid the more difficult business of describing his creative process, but it also means he can celebrate old friends. There was the steel-cased portable he used as a foreign correspondent in the 1960s. "It had a crease across the lid which was done by a bullet in Biafra. It just kept tapping away. It didn't need power, it didn't need batteries, it didn't need recharging. One ribbon went back and forward and back until it was a rag, almost, and out came the dispatches." And after 50 years and a dozen novels including The Day of the Jackal, why change now, he asks. "I have never had an accident where I have pressed a button and accidentally sent seven chapters into cyberspace, never to be seen again. And have you ever tried to hack into my typewriter? It is very secure." Although he laughs as he says it, Mr Forsyth identifies the continuing attraction of a typewriter for thousands of people. They find a computer distracting, unreliable or just plain terrifying, and they have a love for the tangible. As he puts it, "I like to see black words on white paper rolling up in front of my gaze". Mr Forsyth's novels are so popular that he could write them in the sand and publishers would still queue up for his business. But who else is still pounding rather than pressing their keyboard? The Japanese multinational Brother sold 12,000 electronic typewriters last year in the UK, which is its biggest market in Europe. Brother UK sales director Phil Jones says customers are generally older people, although his company also sells a number to students. He says typewriters remain a cheap way to develop keyboard skills. The most basic model costs around £80. "Typewriters are much more straightforward to use than computers as they only have one function - typing," says Mr Jones. And typing is the only thing that Maureen Huggins wants her machinery to do. A reporter for 52 years, she uses a manual typewriter for her work at the Norfolk Courts Press Agency. Stories are then faxed to newspapers and broadcasters. Mrs Huggins tried using a computer about 15 years ago and the memory is still raw. "I had four pages of instructions I had to learn, to send [my previous employers] the stories. Then the blooming thing blew up and they told me that it was my fault, and it wasn't, it just burnt out." 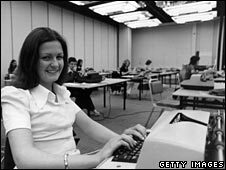 She says she can produce her stories at least as quickly as her rivals, because the risk of technical failure is virtually nil - she keeps a spare typewriter at hand - and because the typewriter encourages her to get the story right first time. This may sound like an impossibly Spartan ideal, where cut and paste is done with scissors and glue, and deleted words remain on the page as angry little blobs. But for some left jaded and distracted by their smarty-pants computers, it is tempting. The writer Will Self is a convert. He went back to using a manual typewriter several years ago. "I think the computer user does their thinking on the screen, and the non-computer user is compelled, because he or she has to retype a whole text, to do a lot more thinking in the head," he said in a recent interview. That doesn't necessarily mean that Royals and Underwoods are elbowing PCs and Macs off the desk with their jabby little carriage return levers. But even for the technologically savvy, they have their uses. Richard Polt, a philosophy professor at Xavier University in Cincinnati, Ohio, collects old typewriters but is sufficiently computer literate to run an attractive website devoted to them. He remembers struggling over a book he was writing. "There are so many distractions with the internet, it is also so easy to change and delete what you have written. It is too easy to dither." So he turned to one of his 175 old typewriters. "I didn't compose most of the book on a typewriter, but every once in a while I would put out a few pages on a typewriter, a first draft, and it was kind of refreshing." He knows of others, especially in the early stages of creative writing, who have benefited in a similar way. This can be achieved without a typewriter. The right software can turn the flashiest computer display into a technological boot camp - an early 80s green screen stripped of dancing paper clips and easy escape routes to the internet. Useful, perhaps, but not beautiful. Turning a computer into a prop from Ashes to Ashes will never have the aesthetic charm of a Remington Noiseless. It is this historical, emotional pull which draws a particular kind of student or aspiring writer to the typewriter. I don't know why, but they usually seem to be men, and their heroes are hard, brilliant men from the last century. Posing on their blogs with an antique machine, all that separates them from Hemingway are two dozen cocktails and his ability to write. If there really is a move back to typewriters, it probably won't come in time to save what is left of the market. Brother UK's Mr Jones admits he is "surprised" that people are still buying typewriters, and "amazed" his company sells a handful for more than £500, which would buy a laptop. Typewriter sales are falling 10% a year at the company, which is better known for its printers, faxes and sewing equipment. Perhaps more surprisingly, demand in developing countries is also falling sharply. Godrej Industries, an engineering and consumer products conglomerate, owns the last manual typewriter factory in India. Senior general manager Sorab Barekh says two-thirds are exported, with various typefaces, to Africa and South East Asia. They tend to be used by remote government outposts which have a poor electricity supply. Sales are falling so fast that more than half a century of production might cease within three years, he says. But for a long time yet, anyone who wants a typewriter will be able to pick one up at a car boot sale for roughly the price of a replacement ribbon. And even when the last carriage return rings, their legacy will go on. The "qwerty" keyboard was devised as a means of keeping commonly recurring sequences of letters like "th" and "an" apart so typewriter keys did not stick. There is argument about whether a different configuration of letters would enable faster typing, but an educationalist who tried to change it in the last century likened the challenge to reversing the Ten Commandments. The biggest inheritance from the typewriter, however, is the fact that lots of people reading this at work will be women. Typing classes mushroomed at the end of the 19th Century, and this helped many women to enter paid work for the first time. By 1901, Britain had 166,000 female clerks, up from 2,000 half a century before. It was a limited emancipation. The new employees (often called "type-writers" themselves) were accused of stealing jobs from men, depressing wages and sexually tempting the boss, and their chance of career progression was often nil. But for women to have any job outside the home was revolutionary. So while the pen may be mightier than the sword, the typewriter was once mightier than both. I exchanged my mother's 1960 era typewriter only after our neighbours complained of the noise at night. Whatever I wrote always seemed to come more easily on the typewriter. Although I bought a laptop in its place, I find I use the computer for my iPod (and the occasional game of solitaire) and write now with a pen & paper. I'd love to get a typewriter again, but cannot find them in my area. They still make identity cards and drivers' licenses with typewriters in the Brussels communes. Computers would probably make things faster and more efficient, eliminating precious jobs in this third-world banana republic. Computers are great when they work. I love my laptop and it makes communication easier. However, e-mail and instant messaging is obliterating the use of the telephone. I e-mail my friends rather than phone them. Communication is getting less personal and I can't remember the last time someone wrote me a letter. From that perspective I say we should bring back the typewriter! I was poking around a charity shop a couple of years ago when I saw what looked like a very small suitcase. Upon closer inspection I opened it up and saw it was a hard plastic case enclosing a typewriter. I thought I'd buy it for the novelty value (it was only £10) and took it home. Now, years later, I absolutely love my little Adler Tippa and, given the choice of writing something on my Macbook or on my Tippa, the Tippa wins (nearly) every time. There's something so much more satisfying about printing something directly onto a blank sheet, rather than re-organising a few pixels on an electronic screen. I learnt my keyboard skills on an electric typewriter and my speed on a computer is around 100 wpm. However, as I am old enough to have been properly educated by learning grammar, punctuation, sentence structure, spelling, etc., I am capable of composing on-screen without difficulty. I love my computer, especially e-mail, and I write my e-mails as if they were letters written by hand. A typewriter is handy for envelope printing - most digital printers require awkward handling to print an envelope. Also, don't forget the European keyboard. AZERTY rather than QWERTY. Once had to use an AZERTY keyboard at a client's office for several hours - terrible time of it. You're absolutely right, I am a female of a certain age reading this at work. I still have my portable manual typewriter, bought 25 years ago and I find it particularly useful when filling in forms. Whenever my home computer seizes up (which happens fairly frequently) I have my faithful old friend to fall back on. Long may the manual typewriter continue. I very much doubt that the typewriter comeback will last long. The hassle of having to use paper, not being able to e-mail, storing your documents in physical form, and the risk of having to re-type the whole thing if you make a mistake or damage the hard copy is just too much in this day and age. Especially if you have to compete with someone else using a computer. Spell check is also an essential crutch for many. Working on a computer means you never have to use Tippex again. I taught myself typing as a child 50 years ago, and over time owned numerous antique and modern typewriters. I loved the smell of the ribbon, the sheer physical energy and clackety clack of the old machines and the joy of cleaning out the lead characters with a toothpick while ruminating. But was I relieved with my first computer not to have to retype each time I made an error. I got through undergraduate and Master level courses using a Brothers portable. I composed as I typed, and had to really block out my words BEFORE I started to put them on paper, which made my stories/papers flow better. I also found I was much more concise in my wordage, being a lazy fellow. I still have a portable brother typewriter, that I bought in 1980, basically to type resumes, to apply for jobs, when I came to the US. It is amazing, that it has a small footprint, and can work as a laptop. No messing with disks, CDs, or floppys, no buying software updates, just one wire runs between it and the wall, and you can work it at your own pace, always. I should by typing away at work writing a user guide, but the easy escape route to the internet has brought me here instead. Is that irony? Maybe I should look that up, after checking my e-mails. Not to be pedantic, but there is no such thing as "disk defragmentation errors". Some author might say "I never use a computer" but that's not true. If they insist on producing hard copy from a typewriter then it just means someone else is going to have to transcribe it for them. (How did they think the book got transmitted to editors and typeset? Quills? Hot lead? Magic?) Its the same with material in the workplace. Its not about "computers" - they're producing information, not pieces of paper, and information that's not machine readable is useless. Many late model typewriters are actually small computers. They're cheaper to make than mechanical typewriters and are more versatile. I fell in love with the typewriters when I started learning to type. The challenge was to get an even print on the white paper without mistakes. For someone like me whose native tongue was not English, added a bit more to the challenge. I happened to top my typing institute results at that time. The skill I learnt continues to help me in my IT job. Ah, this international conversation would not take place but for the plentiful amount of computers connected to the world wide web. And as interesting as these chats can be, the volume of them is overwhelming. So much information and many opinions are public, but how much of it can we process, and how much time do we waste filtering through it? There is no going backwards, but it is almost too easy to communicate. Even here I can fire off a bit of an opinion that otherwise I would've kept to myself or reserved for dinner conversation tonight. I wonder if it was better when it actually took considerable effort it took to publish our opinions. We were certainly better self-editors then.